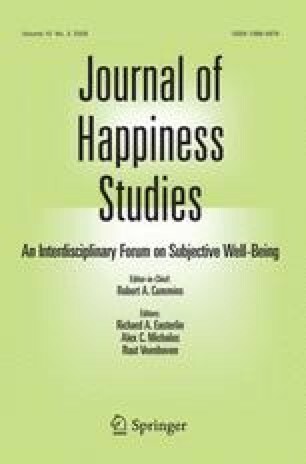 The association between happiness and social relationships was examined in 9- to 12-year-old children. Participants included 432 children and their parents. Children’s happiness was assessed using self-rating scales, parent’s ratings, and the Happiness and Satisfaction Subscale from the Piers-Harris Children’s Self-Concept Scale, Second Edition (Piers and Herzberg 2002). Children’s social relations were assessed with items from the Piers-Harris scale and questionnaires given to the children and their parents. These items were grouped into two positive (i.e., family and friends) and two negative categories (i.e., negative relations with peers and behaving badly toward others). Variance in children’s happiness was partially accounted for by positive social interactions involving the family (e.g., children agreeing that they are important members of their family) and friends (e.g., parents reporting that their children visit with friends more frequently). Negative social interactions also explained variance in children’s happiness including negative relations with peers (e.g., children agreeing that they feel left out of things) and behaving badly toward others (e.g., children agreeing that they are often mean to other people, and they cause trouble for their family). Demographic variables related to the family (i.e., number of siblings, age of parents, and marital status of parents) were only weakly, or not at all, associated with children’s happiness. The results parallel findings from the literature involving adults and adolescents; social relationships are significant correlates and predictors of happiness. Preparation of this article was supported, in part, by a grant from the Michael Smith Foundation for Health Research awarded to Mark Holder and a UBCO internal research grant awarded to Mark Holder. We are grateful for Andrea Welder and Andrea Klassen for reading and commenting on an earlier version of this paper, and for Tabatha Freimuth for the data collection.